The congregation meets for worship in the ‘Upper Room’ at Pippins Community & Business Centre on the corner of Stoney Lane and Lyme Road. This room is open to all users of Pippins during the week as well as the wider community. The monthly 4.00pm services, which are ecumenical, begin with refreshments and include celebration, reflection, discussion and Iona-style worship. Every week Deacon Becky leads a bible study for recovering substance abusers in the Upper Room. We have good ecumenical links and are involved in other church-led activities in the Pippens like the Axminster Job Club which meets every Thursday in conjunction with East Devon Citizens Advice. 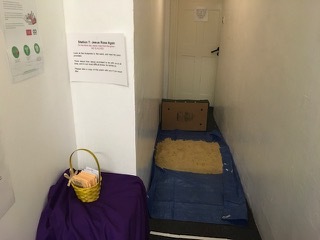 Before Easter 2019, we displayed seven stations illustrating the story of Holy Week and Easter Day. Station 1: The journey begins. Jesus entered Jerusalem, riding a donkey, while the people waved palm branches. Jesus was hailed as a king but a few days later the same crowd shouted ‘crucify’. 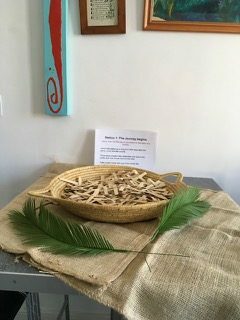 Visitors were invited to ponder on the meaning of ‘celebrity’ in today’s culture, then to take a palm cross. Jesus ate his last meal with his friends and then went to the Garden of Gethsemane to pray. He knew he would suffer and die. He carried a heavy load, and he wanted to ask God if there was a different way. 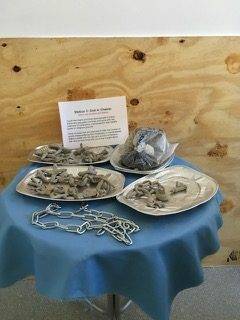 Visitors were invited to hold a white stone and think about the heavy loads that lie deep inside us. Then they might lay their stone at the foot of the cross and give their worries and fears to Jesus. Jesus was arrested and bound. 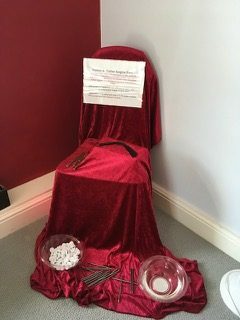 Visitors were invited to hold a nail and remember the suffering of Jesus and the words he spoke. Then, to take a dissolving tablet and drop it in the water to show that our sins are also forgiven by God. 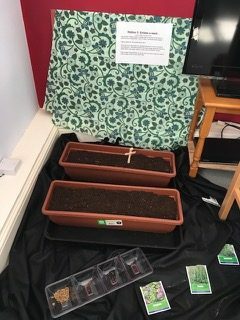 Visitors were invited to take a seed from the packet and hold it, thinking about the lives that have changed because of Jesus’ sacrifice. Then, to think about others in modern times who have given their lives for the sake of others. Seeds for planting were provided, an action symbolic of making the world a better place. Jesus’ dead body was taken off the cross and placed in a borrowed tomb. 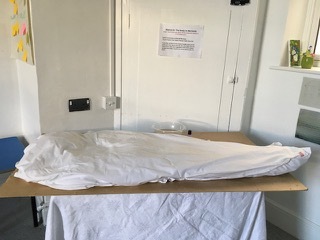 Visitors were invited to spend some time looking at the body and trying to imagine how Jesus’ friends might have felt. Then, to sprinkle some drops of water over on the cloth and think about anyone who has died recently, and maybe pray for them. 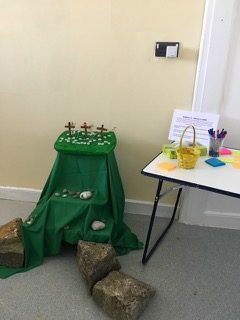 Stations 7: Jesus is alive! On the third day Jesus rose from the grave – HE IS ALIVE! Visitors were invited to look at the footprints in the sand, and read the poem provided. Then, to think about how Jesus promised to be with us at all time and how, in our most difficult times, he carries us.